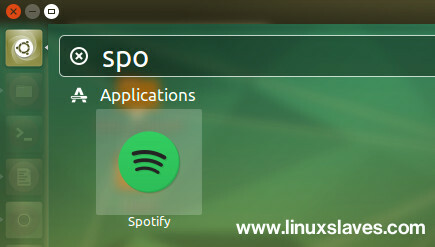 Spotify app for Linux - A Millions of people stream music every day. Spotify is one of the stars in streaming music area. The app boasts collaborative playlists, commercial-free listening, on-demand playback, and cool features. Today I will show you the step-by-step installing Spotify in Ubuntu and derivatives e.g Elementary OS and Linux Mint. Spotify is a digital music service that gives you access to more than 20 millions of song / tracks, build playlist, and get the listening recommendations launched in October 2008 by startup Spotify AB. The app available for smartphone, tablet ( Android, iOS ) and major desktop operating system including Linux, Apple MacOS, and Microsoft Windows. Since early 2013, Spotify has had a web player available for use at its official Spotify Webplayer. An ad-supported free listening option lets you play any artist collection or playlist in shuffle mode, but you cannot play a song on demand. Meaning you will need to upgrade your account to Spotify Premium in order to unlock all features e.g download music for offline, free ads, and better sound quality. 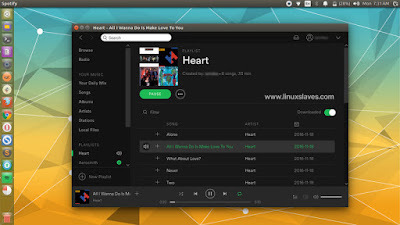 Spotify for Linux is released as a Debian package and works perfectly with the latest Long Term Support release of Ubuntu ( I've tested the app in Ubuntu 16.04 LTS, and Elementary OS Freya which is based on Ubuntu 14.04 LTS ). Cheers! Spotify ready to use in your Ubuntu desktop! As you know, Spotify and Musixmatch are ending their partnership, and as a result, the lyrics function was removed from the music streamer’s desktop app as of May 27. But please do not worry, there’s a new app that fills the gap. Please check our new post to learn how to displays songs lyric on Spotify app. These were all to run Spotify in Ubuntu Linux and derivatives system like Linux Mint and Elementary OS. Hope you've enjoyed reading this tutorial as much I’ve enjoyed writing it and thanks for visiting us!